We created the Contact Directory app so you can keep a neat list of key contacts to easily reach people and map important locations at school. You can simply copy the app and replace its data with your own. Continue reading to learn more about how we built this app. 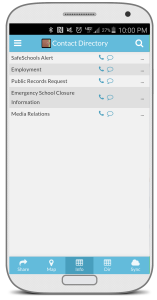 The contact directory app combines information available in three separate tables to provide students and staff with a quick reference to the key locations and contact information for a school. The app automatically converts phone numbers to action buttons so the user can call or text the number. It also shows a map with building locations so the app user can see the location of any of the contacts in the directory. The app is split into three views. One is a map, the second shows key contacts and the final view is a complete staff directory with phone numbers and locations. The App Creator can easily update the spreadsheets that hold the data so the app users get the latest and greatest information regarding their school. This is a powerful way of sharing key information with a broad set of users while managing the content using a familiar tool: Spreadsheets. Ref-- There are three tables in the app: Locations, Contacts, and Directory. The Contacts table is represented by the “Info” view and the Directory table is represented by the “Dir” view. Notice the Location table does not have a view-- this is because it is only being utilized for the ref. It’s helpful to know where each contact is located, but this information might not be important enough to get its own view in the app. This is where the ref type is really helpful-- you can in essence “refer” each entry to another set of important data that doesn’t necessarily need its own representation in the app. 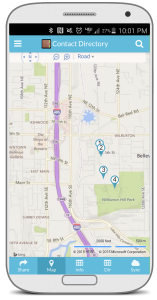 Map-- Because we included an Address column, AppSheet automatically produced a Map view in the app. You can disable (or manually add) this from the UX tab. 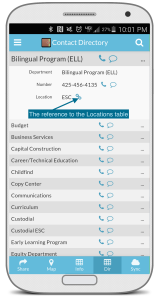 Direct text or call-- The “Phone” column activated the Phone Field Type in AppSheet and appropriately displayed the corresponding icons users can use to call or text the contact straight from the app.